I could tell you that this is Matsu, one of the members of Super Mega Badboy Boyband EXILE. I could tell you that his hair and costume is referring to Osomatsu-kun, the title character of the iconic, long-running manga turned anime. I could even tell you that Chip!Chop is a product of the Meiji chocolate company, of chip shaped cereal pieces sandwiching a thin layer of chocolate filling. But does any of this really matter? 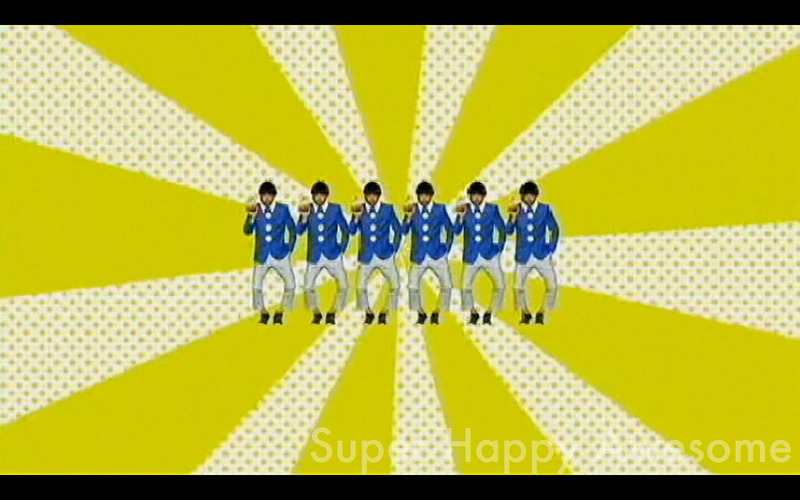 This entry was posted in Video and tagged Chip!chop, Dance, Matsu, matsukun, meiji, music, osomatsu, osomatsukun, video. Bookmark the permalink. Haha…he just looks so dirty. Right? His face is all shiny, and his mustache is all creepy…maybe that’s why I find this video slightly unsettling! hahaha! So wierd! There’s something really strange about how crazy/funny the song and outfits are contrasted with the super-serious/creepy expression on the guy’s face. Just found your blog … Please, please, please translate the commercial/have someone translate it for you and post here! I can’t find it anywhere. PS The really tasty-looking, yummy-smelling baked goods sold in kiosks in Seoul’s subway are not filled with chocolate. 😦 They are filled with red bean paste. Bleeeech!